Forget What Did: Also, I'd like to build a giant village. On a 10/1 scale. I think it might be worth arranging a "Model Villages Around Great Britain" tour. I'm sure at least one very bored person would sign up, provided the bus has air-conditioning and there's a break for lunch. Here's a great post by The Jules at The Gravel Farm. I'm not Jules. Obviously. Wow, I think you should. That's really funny. Silvertongue: Assuming you mean that my tour idea is funny (Kitten Kong was pretty great, too), I'd love that! Imagine the Halloween "Haunted Model Villages" tour? Maybe the ghosts of 12 inch fashion dolls can haunt the village pub. Trained rats with black capes and little treat bags can trick-or-treat. Endless fun! 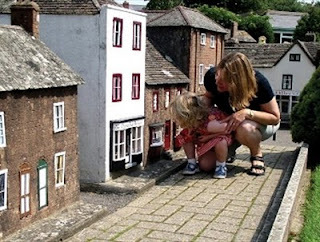 Sadly, I live in America where we don't have (as far as I know) as many model villages per capita. Maybe none. If you're in GB I think you should take my tour idea and run with it. I've never visited, or even seen, a model village. I can understand the appeal though: "I am a giant! Fear me puny residents of this quaint and olde world style community!" Is it a West Country thing? Nicole: Perhaps Silvertongue meant that John should give up his job and found his own model village? Someone needs to make a giant village designed just for the holiday season...that could probably make some money all year round. I think that's a great idea. The other model villages would be SO irritated. Re your photo of woman & child peering inside a model house... doesn’t poor Jon Holmes get any privacy?! Bourton-on-the-water is the best one. Since the model is of the village itself, it has to contain a model of the model, which must have a model of the model of the model... The result of this infinite regression is, of course, the space-time rift in Cardiff. Jazz: Of course he did! Making me an idiot. I agree, then. Do it! Giant villages. I think you would love Madurodam in The Netherlands.